Download and install the latest Bugsee.unitypackage package and install it in your project. Note, that if an older version of Bugsee package was installed in your project, it is necessary to remove "Plugins\Bugsee" folder first. This should install all the necessary files in the Assets folder of your project. Once the component is added, you will be presented with the options screen, which contains Android and iOS apps token fields. If you compile your app for the single mobile platform, you can set only corresponding app token. Bugsee can collect additional information about device GPU model and supported GL version. But it requires additional installation step, which consists in adding BugseeEventsListener script to MainCamera. 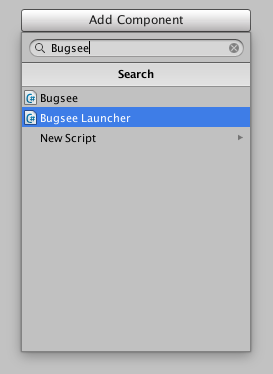 You should select MainCamera, then click Add component button, select Scripts->BugseePlugin->Bugsee Events Listener. After this Bugsee will be able to listen for rendering events in order to retrieve GPU info from GL context. Currently GPU info is not retrieved, when Multithreaded rendering Player setting is enabled.